VÁgtÁzÓ HalottkÉmek - Bite the Stars! Ektro Records obviously knows more about VHK whole body of work, much to my shame and chagrin, and were undoubtedly proud to have introduced the first full-length album by the band in the last 13 years. 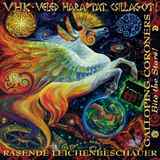 It is just that somehow I thought that Galloping Coroners would be … more galloping and punky. Instead Bite the Stars! presents an exercise in the freeform music creation, the songs like Handshake, Winged Sky, Moons Towards East and Inner Universe being spacey shamanistic incantations more than anything. One has to really let go and submerge fully into this music (weed would probably help) to start flowing along the jangly meandering of Winged Sky, which on some subconscious level passes off as a psychedelic romance. As far as post-punk goes, Celebration of Life and Hun Brotherhood do push up the tempo. Celebration of Life reaches the breakneck pace I wanted to hear, but extra folksiness would have really brought this over the top. Hun Brotherhood is fun, chaotic, tripping over itself with various bells, whistles and yells, but comes all the way at the end after you have to sit and endure the rest. The moments I enjoyed on Bite the Stars! the most were the ones where VHK actually came out of their shamanistic stupor and built their songs up, pushing Falling into Love, Moons Towards East and Inner Universe into crazy desperate hysteria amidst rolling and still freeform percussion. It is if the journey through the weird enchanted forest finally ends in a run onto an open steppe, with runner picking up the pace all the way to the inevitable cliff from which there will be no return. Yet the run can’t be stopped, and things are not going to end well. Again I admit I probably went into this with enormous expectations, seeing how the band achieved a cult status in Europe, in part because it was prohibited to play live in the socialist Hungary. So, I probably did not understand the music of VHK as a whole, but my car is my witness I played the album many times. As much as I am into Diablo Swing Orchestra, Stolen babies and Estradasphere I could not get into this album completely. In the end I will have to score this, but others, with more experience with the VHK prior art and less expectations will probably get more out of Bite the Stars!